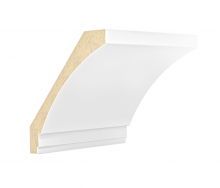 We carry a wide variety of MDF Cornice Profiles that range from 3" tall all the way up to a 20", five-step bracketed profile as shown below. Everything is MDF except for the bracket which we space out at pin in by hand after the trim is installed. To address the needs of the growing number of customers who are looking to enhance a Great Room or add grandeur to a dining room without the mess, of plaster. With the Tuscan five-step profile, once again Elite Trimworks breaks new ground as far as what can be done with wood mouldings.